Simple and easy to use ID card and label maker software provides a straightforward method to craft beautifully designed ID cards, badges, visiting cards, logos, stickers, coupons, vouchers etc in less time and get them printed using technically advanced printing options. Software is specialized with a creative platform enclosed with excellent image designing objects like pencil, pictures, text, barcode, rectangle, ellipse etc to create user desired style of ID cards relevant to personal as well as business needs. 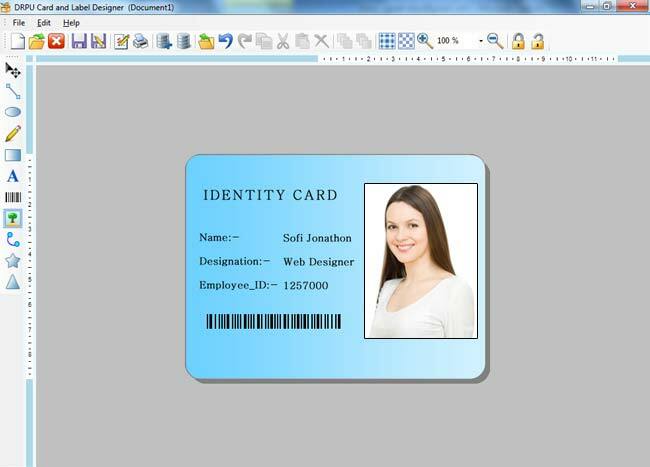 ID card and label maker software provides users with a fun way to create attractive labels or ID cards having customizable font and color setting features with ability to choose from a large numbers of options as desired. Card maker software offers a GUI enabled interface that can easily be worked upon by all types of users without any prior technical expertise. Provides options to either edit an existing card or create from scratch. 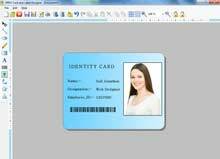 Advanced image designing objects provides a helping hand to create ID cards of one’s choice. Photo, text, graphics, logos, barcode adding features. Create multiple ID cards having different text and barcode value. Supports any major Linear and 2D barcode fonts. Password setting features during label creation which prevents from unauthorized access. Rectangle, Rounded Rectangle or Ellipse shaped labels or cards. Software is easy to use and cost effective. Even a newbie in computers can implement the product to create ID cards, badges and labels. Users need not go through any technical training before implementing the product. Free trial facility! Free of cost trial demo software is available for download at barcodelabelmaker.org so that users can easily check the software features and working abilities before deciding to purchase the licensed software at low price.